Monograph of WW2 German 10.5 cm leichte Feldhaubitze 18 (light field howitzer 18 - le.F.H.18) is 16th book in the Model Detail Photo Monograph by Rossagraph company from Poland. Featured in the book are both basic le.F.H. 18 and later le.F.H. 18M variants. The soft cover book is a bi-lingual release with al the text printed in both Polish and English. It contains 32 pages, 155 mm x 215 mm in size. The book starts with a table containing howitzer specifications and on the next page we can read one paragraph of text with a history of the weapon. Then we get six historical photos of the German army howitzers during WW2 - two of those pictures are in color, the rest are black & white. On following pages are photos of two exhibits from Warsaw Museum of Polish Army. One of them is original le.F.H. 18, and the other is modified to le.F.H. 18M standard (added muzzle brake). All details of the howitzer are photographed at various angles on close-up photos, but authors didn't forget about several good quality general views of the whole gun. There are both color and black and white photos included - in total book contains 38 color and 51 b&w photos. On the left are two color historical photos of howitzer in German army, on the right is Warsaw museum exhibit. Black and white detail photos. Very high quality color detail photos. 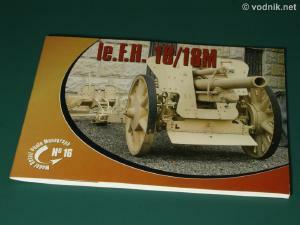 The book is highly recommended as a reference to all modelers planning to build excellent AFV Club models of le.F.H.18 and le.F.H.18M in 1/35 scale.